I got the following page in response to attempting to create an "Arizona Diamondbacks Account" in order to use a corporate discount to purchase game tickets. 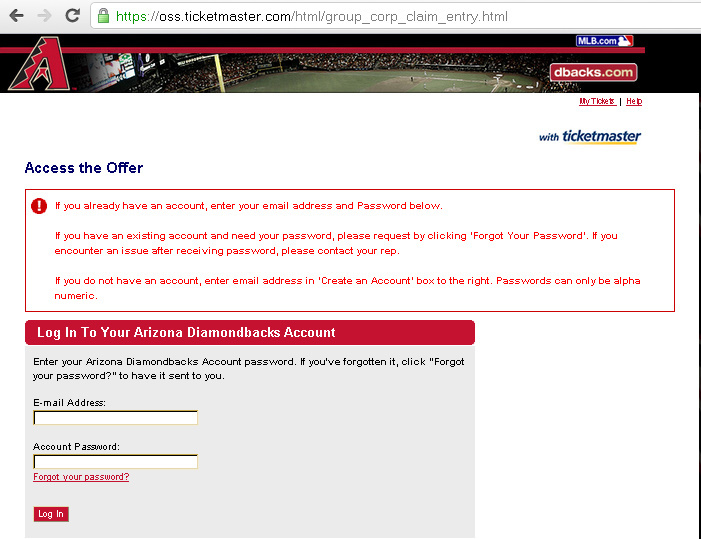 I have never before created an "Arizona Diamondbacks Account". However, this error message seems to suggest that it believes I have already have an account associated with my email address. There is also no option to create an account on this page. The error message tells me to use a feature that does not exist. After some experimentation, I discover that my "Arizona Diamondbacks Account" is the same account that I have for purchasing tickets from the Colorado Rockies. I wonder why anyone thought it was a good thing to refer to the account by the name of the home team for the ballpark at which I am trying to purchase tickets. Had they indicated that this was a Major League Baseball ticketing account, and not a specific team, it could have saved me a great deal of time.